Anyway, I located a cheap cribbage board and, having managed to decipher the instructions, convinced Susie (who likes to play games, unlike most of her siblings, who unfortunately take after Larry in this regard) to play with me. Susie took to the game like a fish to water, displaying a surprising facility for counting hands and computing odds. I played with her any chance I got, because...um...homeschooling. And maths. We upgraded at Christmas to an honest-to-goodness professional board, complete with unbreakable metal pegs and a sliding top that hid a storage compartment for the cards and such. A beauty, really. 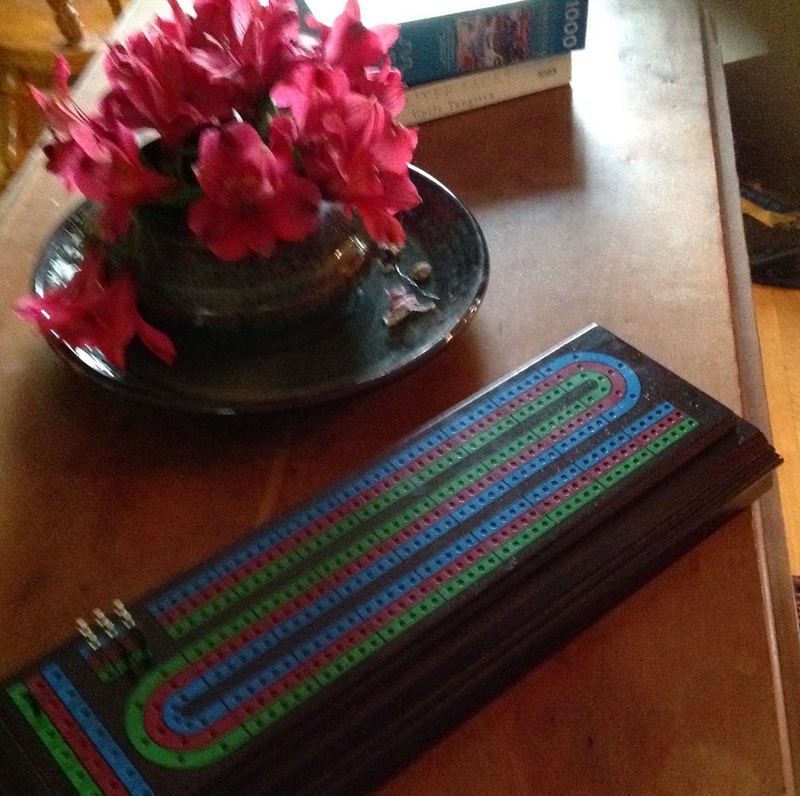 During the Great Homewrecking of Winter 2015, our handyman noticed this cribbage board and said, "Oh, hey! Do you play? I love that game - used to play for a nickel a point." Hmmm, I thought. Here's a good chance to show Susie that gambling doesn't really pay. "Hey, Susie," I said, to my unsuspecting youngest. "Do you want to play for money?" She agreed, happily, and I proceeded on my mission to show her that probability and luck tend to even out for two players of similar abilities. Because, hey, I am at least as smart as a 9-year-old. Except...not. Turns out, Susie is REALLY GOOD at cribbage. Long story short, over the past month? Susie has netted 15 dollars. And now she thinks gambling is an awesome way to earn money. Hahahaha! Funny how that happens. Oh, no! It's just not fair when our parental lessons get turned backwards! My daughter loves, loves, loves cribbage, but I am hopeless at it - I'm great at math concepts, but can't add in my head. Go figure. Our cribbage board is shaped like a canoe. Hahaha! And for once, I have to side with Larry. I'm just not a games person. Isn't Susie the one who also wins at poker? My family loves games, and that one is a particular favorite with my FIL and his brother. I used Kings in the Corner to practice maths when we were homeschooling. We took turns reciting our "times tables" incrementally with each play.